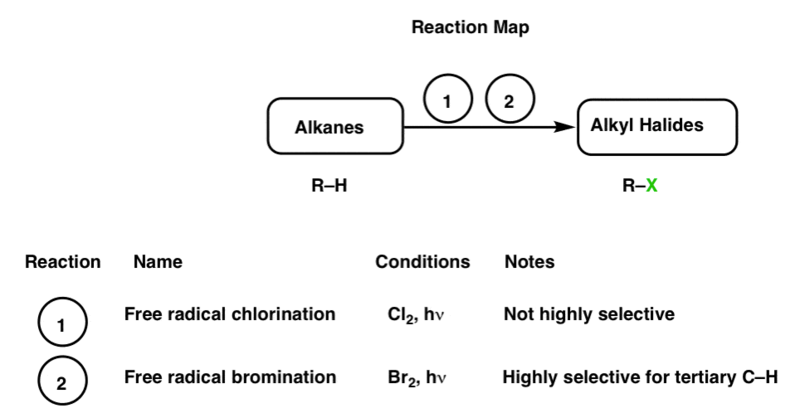 In this post we’re going to begin building our reaction map, starting with the simplest organic compounds of all: alkanes. *We’ve only learned one synthetically important class of alkane reaction: free-radical halogenation. [Combustion is also technically a reaction of alkanes, but producing CO2 and H2O from organic starting materials is not very useful from a synthetic standpoint!]. You might recall there are two important free-radical halogenation reactions of alkanes: free radical chlorination, and free-radical bromination. 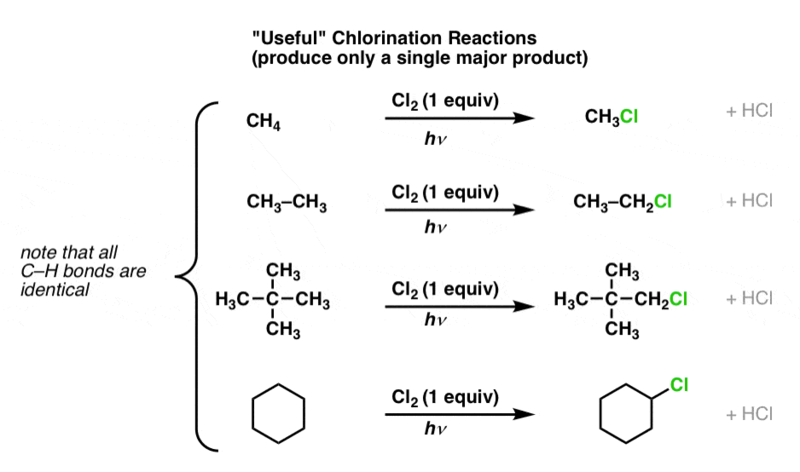 Free radical chlorination is achieved by treating an alkane with molecular chlorine (Cl2) in the presence of light [hγ] or heat [Δ]. As long as one is careful to control the number of equivalents of Cl2, useful products can be obtained, assuming the right type of starting material is used. Note that substitution can occur at primary, secondary, or tertiary positions. This is not true for the vast majority of alkanes! If an alkane contains more than one distinctive type of C-H bond, then we can (and will) obtain mixtures, since chlorination is a relatively unselective reaction. That is, chlorination of primary, secondary, and tertiary C-H bonds occurs at fairly comparable rates. The chlorination of a simple molecule like propane affords a mixture of 1-propyl chloride and 2-propyl chloride. Pentane gives us three products, and so on. From a synthetic point of view, this is not particularly “useful”, since any reaction which produces a mixture of products will require us having to separate those molecules somehow, which is less desirable than if we were to obtain a reaction with one dominant product. For this reason, it’s best to stick to simple alkanes that can provide only one product when thinking about performing a free-radical chlorination in a synthesis. 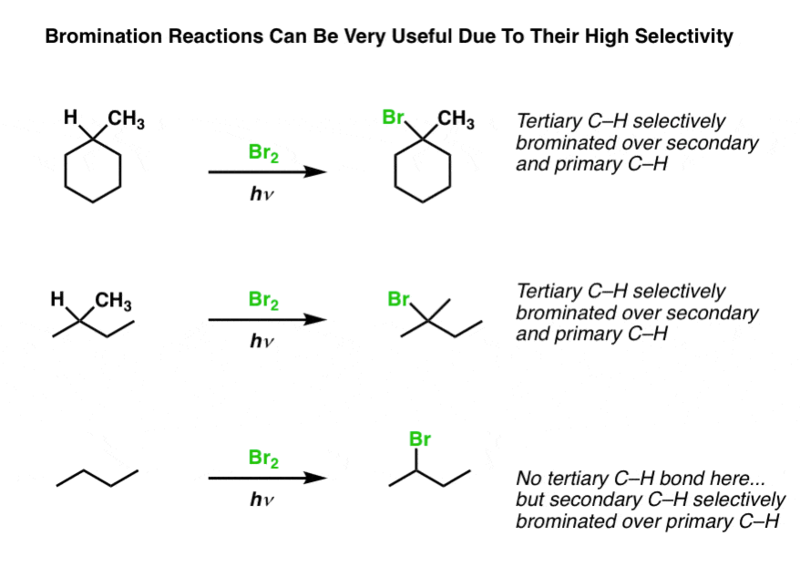 In an earlier post we discussed the reason for the high selectivity of bromine in free-radical substitution reactions. This high selectivity allows us to start with a somewhat complicated molecule such as methylcyclohexane and obtain one major product [compare that to the chlorination reaction of methylcyclohexane, which would give us 5 potential products!]. For this reason free-radical bromination is an extremely handy reaction to have in your “toolbox”, as it allows for the installation of a good leaving group – bromine – on an otherwise unreactive molecule. In the next post we’ll go through the reactions of alkyl halides and show in detail why alkyl halides are such useful intermediates in organic chemistry. *To state things in a more technical way, we’re also starting with carbon at the lowest oxidation state, and will slowly move up the oxidation ladder.